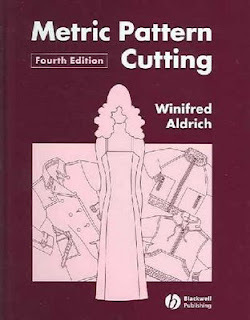 I am looking at drafting patterns today. I've got this book and it really seems to explain the basics of making a 'block' and then adapting it in different ways. I am going to try to use a drafting technique to make my skirts more flared. Also there is a bit about making puffy sleeves from normal ones where you cut the pattern into sections and spread them out. I'll try and explain that better later. I own that book. Its fantastically clear for pattern drafting. I find the children's book from the same series incredibly helpful too. Do you draft patterns on the stand much? I mostly make alterations from existing patterns but I keep intending to spend some time getting the hang of drafting from blocks!